Everyone enjoys the challenge of gaming, whether it’s on the coffee table or a computer screen. But a relatively new game form turns the players into game pieces. Escape Rooms challenge players to solve puzzles and riddles to literally escape a room. According to the Atlantic, the first escape room debuted in Japan in 2007, but now there are nearly 5,000 of these businesses worldwide that combine puzzles, riddles and a mysterious narrative to challenge players. One instructor at Ozarks Technical Community College adapted escape room problem solving to teach her students the “soft skills” employers desire. 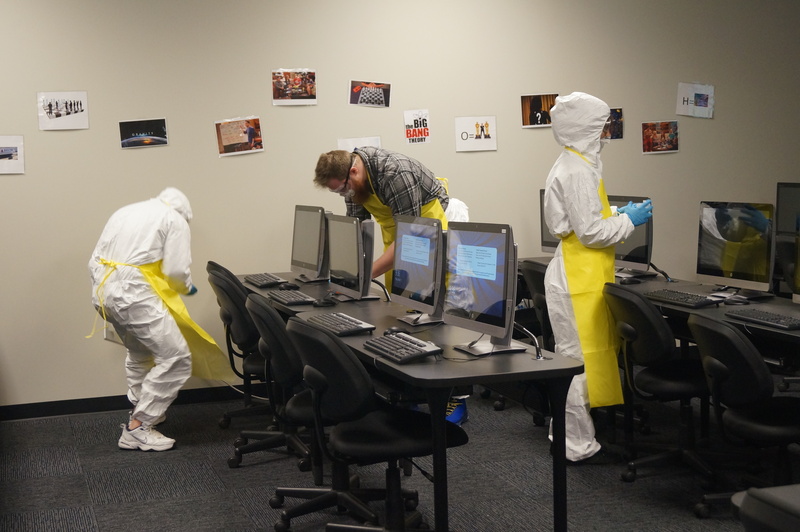 Students in hazmat suits plot their escape from a mad-lab-themed escape room. Ruess teaches Computer Information Science 200, which encourages critical and creative thinking through the use of technology. Ruess, a retired Marine, said she adapted the idea for her class after completing a few escape room challenges herself. Plus, she figured it would “spice up her class” given the 8:30 a.m. starting time. Students had to create a series of puzzles and clues for an escape room that would last between 30-45 minutes. The students also created all of the collateral materials, such as, flyers to advertise the escape room and a PowerPoint outlining the rules. Any necessary props Ruess either brought from home or picked up at yard sales and discount stores. She also had the students give her regular updates where she challenged their premises and assumptions. “I had them run through their ideas, and I poke holes into it until the project came together in a cohesive, riddle and puzzle-packed event,” Ruess said. All of the challenges were completed in the computer classroom, so there was no room to escape from; but the challenges and puzzles were a big hit with Ruess’s students. “This was one of the best ideas for a class project that I have ever done,” one student was overheard saying.